Here we take a look at some of the very best that stand above the crowd due to their exceptional cuisine, atmosphere and the finest service. • El Bulli in Spain is on our list of luxury dining experiences and is one not to be missed. The restaurant was awarded “The World’s Best Restaurant 2009” and “Best Restaurant in Europe.” The Chef also took the “Chef of the Decade” award in 2010. The food at El Bulli defies description and has to be tasted to do it justice. • You may wish to head over to Austria and visit Steirereck. This is one of Vienna’s very best restaurants. This is a must visit place for wine connoisseurs; there are over 35,000 superb bottles on the wine list. The restaurant serves modern Austrian cuisine with many of the ingredients coming from the restaurant’s farm and is located in one of the most stunning settings imaginable. Cheese lovers will also be in heaven here with 120 cheese varieties from more than 13 countries. • Italians are passionate about their food, and one of the very best places to dine in luxury while enjoying a down to earth setting is Le Calandre. Le Calandre is a rustic three-star restaurant where each and every guest gets a hearty welcome from the brothers who run it. Chef Massimiliano Alajmo takes credit for being the youngest Italian chef to be awarded three Michelin Stars. It is dishes such as glazed pigeon served with the essence of red turnip that has won the chef the praise so rightfully deserved. • Heston Blumenthal’s The Fat Duck deserves to be on the list of the very best restaurants because the menu is constantly being tweaked and refined to absolute perfection. The Fat Duck is a somewhat “quirky” choice, and it is not for the faint-hearted. On the menu you may see such as Roasted Foie gras served with crab biscuit and Rhubarb braised in Konbu. The restaurant is associated with high theatrics and has a very fun approach when it comes to dining out. You may want to visit at least once during your lifetime, if for nothing else but the unique experience. 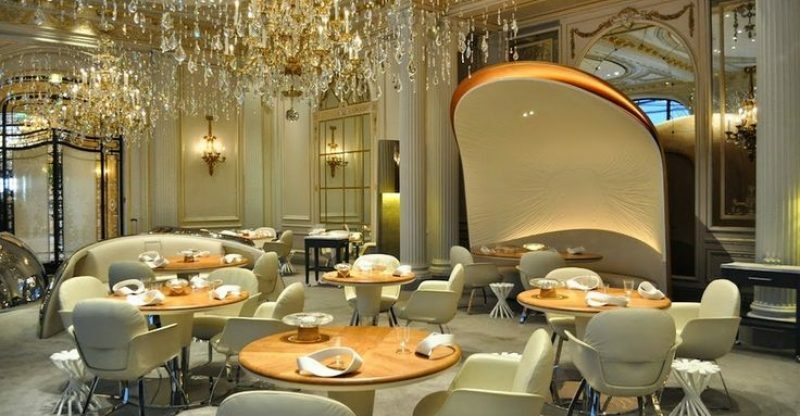 • Finally, the Alain Ducasse Au Plaza Athenee. This restaurant is set in the luxury Paris hotel where guests are served by staff wearing designer uniforms and overhead hang 10,000 plus illuminated pendants. They say you only get what you pay for, and while the price is steep for a plate of beluga caviar and langoustines, it is well worth the extravagant cost. This is luxury dining at its very best, complete with an atmosphere that takes some beating, attention to detail that is rare, and some of the finest ingredients from all over the world. • Clothing Optional Dinners, New York. Don’t we all get tired of dressing up for supper at a fancy restaurant sometimes? As adults who have to run around making ends meet, dressing up becomes a task that one would love to avoid if possible. As rightly as the name suggests, in this restaurant clothing is optional. A diner is a monthly event started by nudist, John Ordover, where diners have to strip off their clothing and dine. • Labassin Waterfall Restaurant, Philippines. Take dining in the midst of nature to a whole new level at the Labassin Waterfall Restaurant. Located at the Villa Escudero Resort, this restaurant is set up at the foot of the waterfall, which means that the water will be flowing across your legs as you enjoy your meal. Moreover, if you feel like having a quick dip in the water, you are free to do so. The restaurant is surrounded by luscious nature that guarantees you an experience you will never forget. • Dinner in the Sky, Belgium. This wonderful restaurant might take your breath away, especially if you are not comfortable with heights. Dinner in the Sky restaurant is located 150ft above the ground, or more like hanging 150 ft above the ground. The food is prepared in an oven, placed right in the middle of the table. All the diners and chefs are strapped in so you can be sure that you’ll be safe up there. If you want to get your blood pumping while you enjoy a delicious meal, this is the place for you. Author of the article is Gaetano Esposito, he also writes for Eleventy Traveller blog.